With the holidays upon us, there are ample opportunities to ruin your diet, whether it's eating too many chips and guac at the annual office holiday party, scarfing down a batch’s worth of cookie dough at your neighbor’s baking bonanza, or drinking one too many eggnog cocktails. Thankfully, there are some easy ways to enjoy yourself this season without gaining that dreaded winter weight. 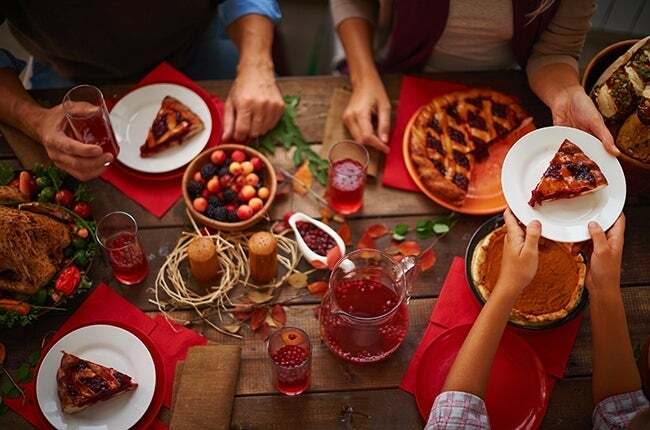 Read on for tips on keeping up with the festivities without letting them ruin your diet and fitness goals. While it’s normal to have your workout schedule turned upside down with all the social and family events that occur this time of year, carve out 15-20 minutes of each day when you can focus on your workout to maintain your fitness. Just 15 minutes of exercise can help you maintain your current fitness level, and, as celebrity trainer Tracy Anderson says, it’s the quality and experience of your workouts that matter, not the length. Telling yourself you’re going to stay away from the cookie plate is only going to make you more likely to over-indulge. Instead, pick out the foods that truly call to you, and enjoy every bite. This way, you fulfill your desire for decadent food, but because you chew slowly and really experience the food, you’re less likely to over-eat. The best way to ensure you’re consuming healthy food during this time of year is to bring your own dishes to holiday functions. There are so many great recipes out there for healthier cookies, cakes, and classic holiday dishes, and not only will you get the joy of cooking for your loved ones, but you’ll also ensure that your favorite dishes are on the table. Looking for sweet treats that are healthy versions of your holiday favorites? Check our our 50 guilt-free holiday cookies. While it might seem sensible to eat less all day in preparation for a big dinner in the evening, this is actually one of the worst things you can do. Doing so leaves you hungry and liable to make poor eating choices just to satiate yourself. Instead, eat normal meals throughout the day so you’re not starving when you show up to an event. Not only is water calorie-free, it can help prevent bloat and, unlike wine or other alcoholic drinks, doesn’t inhibit your food decisions. Water also makes you feel fuller, meaning you’ll eat less, and helps you decipher your hunger cues, so you’re less likely to eat when you think you’re hungry, but you’re actually just dehydrated.